Connecting solar panels together is a simple and effective way of increasing your solar power capabilities. Going green is a great idea, and as the sun is our ultimate power source, it makes sense to utilize this energy to power our homes. As solar power becomes more accessible, more and more homeowners are buying photovoltaic solar panels. However, these photovoltaic solar panels can be very costly so buying them over time helps to spread the cost. But the problem then becomes how do we connect these extra solar panels together to increase the voltage and power output of what’s already there. The trick here when connecting solar panels together is to choose a connection method that is going to give you the most energy efficient configuration for your particular requirements. Connecting solar panels together can seem like a daunting task when you first start to look at how it should be done, but connecting multiple solar panels together is not that hard with a little thought. Wiring solar panels together in either parallel or series combinations to make larger arrays is an often overlooked, yet completely essential part of any well designed solar power system. There are three basic but very different ways of connecting solar panels together and each connection method is designed for a specific purpose. For example, to produce more output voltage or to produce more current. Solar panels can be wired in a series or parallel combination to increase the voltage or amperage respectively, or they can be wired together in both series and parallel to increase both the voltage and current output producing a higher wattage array. Whether you are connecting two solar panels more more, as long as you understand the basic principles of how connecting multiple solar panels together increases power and how each of these wiring methods works, you can easily decide on how to wire your own panels together. After all connecting solar panels together correctly can greatly improve the efficiency of your solar system. The first method we will look at for connecting solar panels together is what’s known as “Series Wiring“. Connecting solar panels together in series is used to increase the total system voltage. Solar panels in series are generally used when you have a grid connected inverter or charge controller that requires 24 volts or more. To series wire the panels together you connect the positive terminal to the negative terminal of each panel until you are left with a single positive and negative connection. Solar panels in series add up or sum the voltages produced by each individual panel, giving the total output voltage of the array as shown. In this method ALL the solar panels are of the same type and power rating. The total voltage output becomes the sum of the voltage output of each panel. Using the same three 6 volt, 3.0 amp panels as above, we can see that when they are connected together in series, the array produces 18 volts (6 + 6 + 6) at 3.0 amps, or 54 watts (volts x amps). Now lets look at connecting solar panels in series with different nominal voltages but with identical current ratings. In this method all the solar panels are of different types and power rating but have a common current rating. When they are connected together in series, the array produces 21 volts at 3.0 amps, or 63 watts. Again the amperage remains the same at 3.0 amps but the voltage output jumps to 21 volts (5 + 7 + 9) . Finally, lets look at connecting solar panels in series with completely different nominal voltages and different current ratings. In this method all the solar panels are of different types and power rating. The individual panel voltages will add together as before, but this time the amperage will be limited to the value of the lowest panel in the series string, in this case 1 amp. Then the array will produce 19 volts (3 + 7 + 9) at 1.0 amp only, or only 19 watts out of a possible 69 watts available reducing the arrays efficiency. We can see that the solar panel rated at 9 volts, 5 amps, will only use one fifth or 20% of its maximum current potential reducing its efficiency and wasting money on the purchase of this solar panel. Connecting solar panels in series with different current ratings should only be used provisionally, as the solar panel with the lowest rated current determines the current output of the whole array. The next method we will look at of connecting solar panels together is what’s known as “Parallel Wiring“. Connecting solar panels together in parallel is used to boost the total system current and is the reverse of the series connection. By parallel wiring panels you connect all the positive terminals together (positive to positive) and all of the negative terminals together (negative to negative) until you are left with a single positive and negative connection to attach to your regulator and batteries. When you connect solar panels together in parallel, the total voltage output remains the same as it would for a single panel, but the output current becomes the sum of the output of each panel as shown. In this method ALL the solar panels are of the same type and power rating. Using the same three 6 volt, 3.0 amp panels as above, the total output of the panels, when connected together in parallel, the voltage output would remain the same at 6 volts, but the amperage would increase to 9.0 amps (3 + 3 + 3), or 54 watts. But what if our newly acquired solar panels are non-identical, how will this affect the other panels. We have seen that the currents add together, so no real problem there, just as long as the panel voltages are the same and the output voltage remains constant. Lets look at connecting solar panels in parallel with different nominal voltages and different current ratings. Here the parallel currents add up as before but the voltage adjusts to the lowest value, in this case 3 volts. Solar panels must have the same output voltage to be useful in parallel. If one panel has a higher voltage it will supply the load current to the degree that its output voltage drops to that of the lower voltage panel. We can see that the solar panel rated at 9 volts, 5 amps, will only operate at a maximum voltage of 3 volts as its operation is being influenced by the smaller panel, reducing its efficiency and wasting money on the purchase of this higher power solar panel. 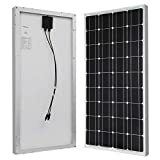 Connecting solar panels in parallel with different voltage ratings is not recommended as the solar panel with the lowest rated voltage determines the voltage output of the whole array. Then when connecting solar panels together in parallel it is important that they ALL have the same nominal voltage value, but it is not necessary that they have the same ampere value. Connecting solar panels together to form bigger arrays is not all that complicated. How many series or parallel strings of panels you make up per array depends on what amount of voltage and current you are aiming for. If you are designing a 12 volt battery charging system than parallel wiring is perfect. If you are looking at a higher voltage grid connected system, than you’re probably going to want to go with a series or series-parallel combination depending on the number of solar panels you have. But for a simple reference in regards to how to connect solar panels together in either parallel or series wiring configurations, just remember that parallel wiring = more amperes, and series wiring = more voltage, and with the right type and combination of solar panels you can power just about any electrical device you may have in your home. For more information about Connecting Solar Panels Together in either series or parallel combinations, or to obtain more information about the different types of solar panels available, or to explore the advantages and disadvantages of using solar power in your home, then Click Here to order your copy from Amazon today and learn more about designing, wiring and installing photovoltaic solar electric systems in your home. Some high quality solar panels you may be interested in which can be connected together and used in solar arrays. I have 6 panels of 8.9Amp and 38.2V each making them in total 2KVA. I have currently joined them in parallel but often the amperes would go down to real low level such as 0 or 10 and the other times it give almost 40-50amps too. Now i was wondering if i need to do the connection right. My Inverter manual suggests Max PV array open circuit voltage of 102Vdc and PV Array MPPT voltage range of 30~80Vdc. It also illustrate an example of joining 2 sets of 30.1V panels in series and three in parallel. Can i join my 2 sets in Series and 4 in parallel? i was wondering if that would even work. I have connected 3 12V 100w panels in parallel to my solar inverter. Each panel current rating is 6.4A. The out put I am getting as about 15 V and and charge is varing from 1.1A to maximum 1.9A. It is supposed to charge at minimum of 10 A. By checking individuals panel the it is showing only 1.1 A charge. I am not able to understand the problem, Could you advice me. I love this lecture on PV solar connection, is very comprehensive and educative. I really appreciate. Please keep it up. I have 2 panels wired in Parallel , I would like to check each one to confirm that they are functioning as they should. I tried covering one panel at a time and the voltage / amps does not change much . Should I disconnect one at a time to get a accurate reading from the uncovered panel or is there a better way? You may not see much change as it is possible your panels have a built-in bypass diode for protection. The only way to check the operation of each panel is to disconnect and test them individual. I have 2 x 100 watt panels, and 2 x 65 watt panels on a sailboat, and a Tracer 3210 MPPT controller. Should I link them in Parallel or series? or the 2 x 65 watt in Series, and the 2 x100 watt in parallel? Again, the connection of your array will depend on the IV input power charcacteristics of your controller, inverter, or DC voltage requirements. I have 16 Solar Panels containing 300watt in each panel while I want to have these panels with 5kv Inverter. Could you please guide that what combination of panels (like Series/Parallel) should I use? That depends on the IV power rating of your inverter and the reason why you purchased 16, 300W panels. hello admin, can I connect inverter to solar panel at the same time to light for charging the battery? Hope it will not cause outbreak? Sir I have 4 solar panel of 350 watts can I use this to 24 volt system which contains 2 batteries of 12 of each volts and ups of 3kv can this system works? Possibly, configure your panels and batteries to operate as a 24 volt system. Sir i have a question i have 300,,watts 43v panel and 250w 43v panel may solar charge controller is mppt-40A with 2 batteries 12v what connection we use. As your panels have exactly the same Voc, connect them in parallel. It depends on the type of chargers used. Parallel charging delivers increased amperage (amps x number of chargers) but it is advisable to use the same type of controller, MPPT and that the controllers are set with the same charging profile for voltage regulation. Also each controller’s Voltage Sense Terminal needs to be connected to the battery bank to ensure each controller is measuring the same battery bank voltage.